We will collect the Import Fees Deposit at the time of your purchase and use it to cover applicable taxes and duties on import. Learn more. The total may change depending on the chosen shipping option and items in cart during checkout. International Product from Amazon.com. Ships from and sold by Amazon Global Store US. International products are sold from abroad and may differ from local products, including fit, age rating, and language of product, labeling, or instructions. Local Customer Service and hassle free returns within 30 days. Any warranty descriptions were intended for US purchasers. Warranty may not be valid in the UAE. Import duties and taxes included at time of purchase. Excellent gloves for dog walking! These are really nice gloves. They are very nice looking and fit my hands well. I use them for dog walking because it is so easy to open the bags to clean up the mess. Before I owned these gloves, it was a pain in the neck because I always had to remove a glove to take care of matters. The feature that I like above other flip top gloves is the little magnet that holds the flap back. Most flip top gloves have a little button that you have to fasten which makes it difficult when I'm trying to walk two dogs in the cold weater! Totes, please make this in thinsulate with a magnet instead of button. These are excellent driving gloves too because they fit so well. Very disappointed in these gloves. I love this style, and i've had several of these I had purchased from Kohl's in the past, but as they've worn and Kohl's had stopped carrying them, I had to resort to online ordering. I was so excited when they arrived. At first I was adoring the feel of the material and eager to test them out here in minnesota as the polar winds were about to give us 30 below weather. After putting them in for the first time I was immediately heartbroken. 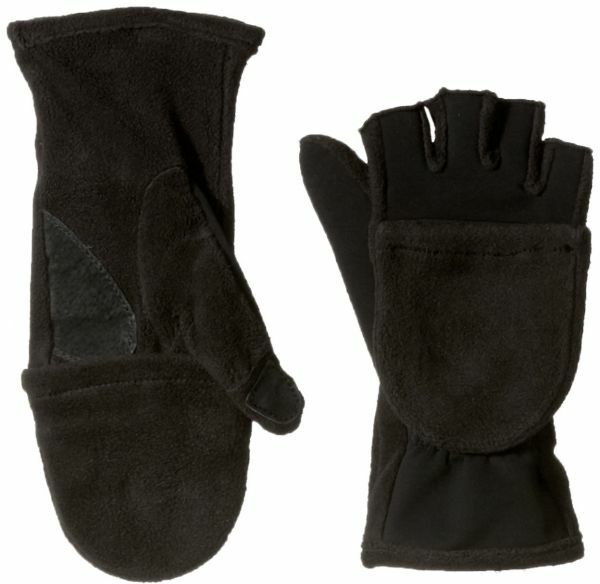 They used a thick material for all parts of the glove, including between the fingers, and a very thin material for the flip top mitten portion. This combination meant that the thick bit in between my fingers was causing them to be pushed apart and blood flow restricted, and the thin mitten portion did absolutely nothing to protect my fingertips from the bitter freezing cold. Complete failure as a whole for my needs. This is a glove only for the convenience of being able to use your fingers and thumb at random. Other than the above mentioned, it provides no warmth on any cold days. It was recently 50 degrees out, I went for a 40 min walk and my fingers were numb by the time I got back in the house. Had to return these--they did not have an open thumb, as stated in the title and description. I really like the features of this convertible glove/mitten but I am not sure how they will work out for me as they are really snug. I have extremely small hands and most Isotoner gloves in "one size fits all" are plenty roomy. These are really snug and I am hoping they will stretch out a bit.